If one of the front pads managed to fall out while riding, he would not have any front brakes at all. Very scary. Needless to say after showing him the failed parts, he will NOT make that mistake again. Exactly why I'm replacing my brake pads again front and rear after 16,000 miles when it looks like I could go another 5000 miles. Cheap insurance. I've seen more than a couple of Volar pad failures in the last 5 years, here, on the other forum, and on ADV. I intend to do most of my maintance. I just bled my brakes on the C14 for the first time. I didn't think there would be any problem as I also work on my old pick up. What had me squirrley was a guy on the other site sayin you had to have a POWER brake bleeder to bleed the brakes on a C14!!! Used my Mity Vac and the brakes were better than when I bought the bike,however I was determined if I could not get them right to man up and get help. All good and I will not cheap out(especially now) when I need new pads! Which pads are you using? Funny. I have had a Volar set on my bike for 4 years, never an issue. They have far outlasted stocks by 2 sets. I have carbon kevlar. There are defects with all manufacturers at some point. Sorry this has happened. Glad you caught it. Looking at the corrosion, and curious as to how the bike had been stored. It looks like moisture found its way between the pad and backing. Exactly. How did moisture get between the pads and the back plate? My guess, as mentioned before, is very poor manufacturing. There is no way ANYTHING should be able to get in there. If you notice in the pic, the rust is only where the pads were bonded. The mounting ears are rust free and they looked just fine when in place on the calipers. It was when I took the wheels off that they fell apart. To answer your question, the bike was stored both inside and out. Probably mostly out. I've never had problems with EBC pads and so that's what I buy exclusively. But, if they ever did that to me, I'd be looking for a new brand. Brakes are not something to take chances with. Actually, it looks like the pads were bonded in two places to the backing plates, and the moisture induced corrosion/swelled metal literally pried the pad material off the plates. I'm running the Volar pads front and rear, have been quite hard on them at times and been pleased with their performance, but this is troubling. Unfortunately this happens more often than you think! 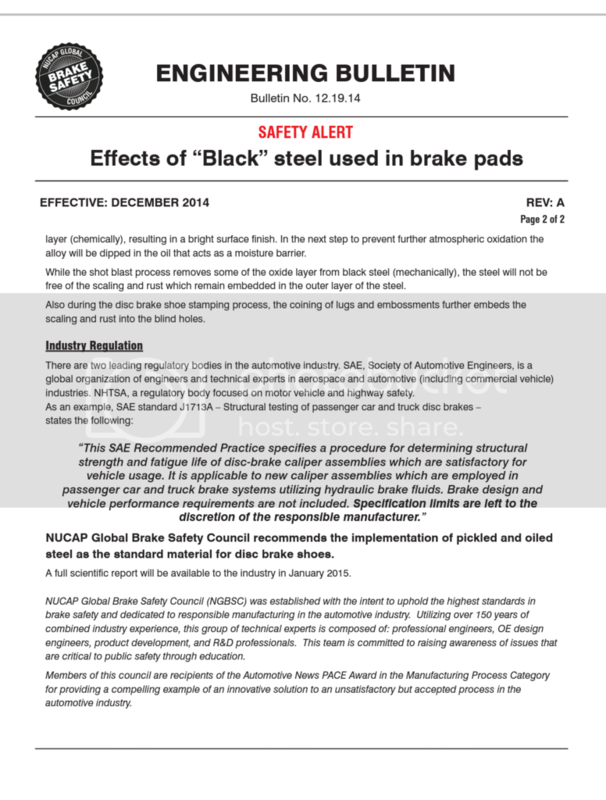 I'm writing to you on behalf of the Global Brake Safety Council (GBSC), which was established with the intent to uphold the highest standards in brake safety. One of the reasons for the friction material falling off the disc brake plate is the excessive rust build-up between the backing plate and the friction, causing what's known as "rust jacking". This is becoming more of an issue because friction manufacturers are using mill scale steel, commonly referred to as 'black steel', which contains a layer of oxides. This layer, if not properly removed, will be trapped under the friction layer during the manufacturing process. These oxides turn to rust and cause separation between the disc brake plate and the friction (rust jacking), which eventually leads to the friction falling off. This is obviously a major safety concern! Currently, aftermarket manufacturers of disc brake shoes are self regulated and are expected to engage in 'responsible' manufacturing. With more and more manufacturers moving production to China and India to cut operating cost, they are also cutting corners and jeopardizing the quality of their disc brake shoes and your safety. The solution is simple: Friction manufacturers MUST use disc brake steel that is free of any mill scale or oxides. This steel is referred to as "pickled and oiled" steel, which goes through a process of acid wash to remove all mill scale and contaminants from the steel. 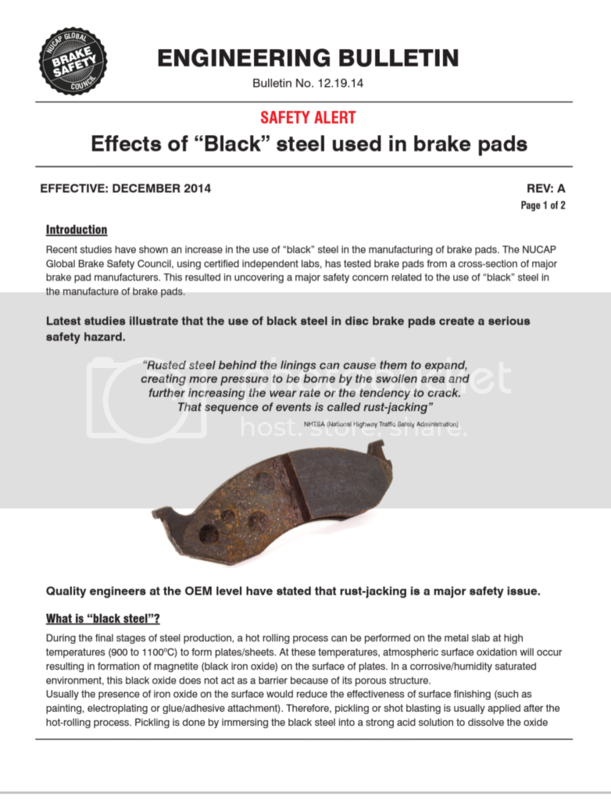 GBSC has released a detailed report on this safety issue in the brake industry and is currently engaging government and lawmakers to raise awareness on this issue and set legislation for all North American manufacturers to adhere to. Please visit our website www.gbscouncil.com for more info and to download the report. I am running cheap rotors off of ebay. So far they are working excellently. I only run EBC pads. Haven't had a prob yet. Nice link. Lots of evidence presented. Hoo boy. Here's the short version. In a nutshell, if shot blasting is used instead of an acid dip to remove oxides (rust) created during manufacture of a backing plate made of "black steel", not all of the oxide is removed, causing less adhesion of finishing products, including pad adhesive, and setting up the possibility of rust jacking and pad separation. That's it, the Volar pads are coming off ASAP.